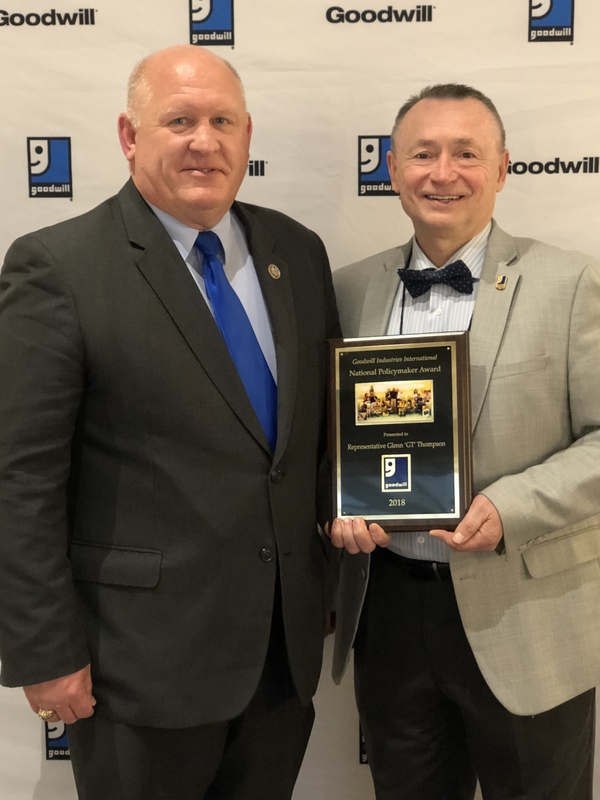 Falls Creek, PA – Congressman Glenn ‘GT’ Thompson (R-Penn) is one of nine members of Congress who received a Goodwill Industries International Policymaker Leader Award this week. The award honors elected officials who support Goodwill’s public policy agenda. Awardees were announced on Thursday, April 19 at Goodwill’s annual advocacy event in Washington, DC. Nominated by Goodwill Industries of North Central Pennsylvania (Falls Creek), Rep. Thompson is known as a champion of people with disabilities. Prior to being elected to the congressional district, he touched thousands of lives of those with disabilities and life-altering conditions as a therapist, rehabilitation services manager and a licensed nursing home administrator. Through his 28-year tenure in the human services industry, he learned firsthand the importance of ensuring quality care and opportunities for all people. Rep. Thompson has always been a strong supporter of Goodwill Industries of North Central Pennsylvania. He has attended several Goodwill events and meetings, and last year he met with Goodwill to discuss the Workforce Innovation and Opportunity Act (WIOA) and how it will impact program participants. Since 1902, Goodwill has been helping people find jobs, build their financial stability, earn paychecks, and enhance their skills. This work has helped millions of people build their careers and experience the pride and sense of community that work brings.